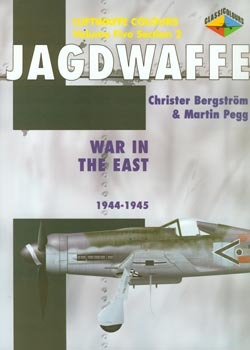 The latest title in the superb Jagdwaffe series looks eastward once again, documenting the long retreat in front of what has become a superior fighting force in the Soviets. The title image and quote sum up that strength, with the classic photo of a Russian soldier waving the Soviet flag over Berlin, and the Wehrmacht stating that "the battle for the capital of the Reich is over." Although the war went badly for Germany during these years, they still managed to put up a fight, with a small handful of pilots becoming legends while the rest of the Luftwaffe suffered horrendous attrition. When an army is no longer on the offensive and is forced to give up ground, standardization of camouflage seems to be the first thing to go, and we see lots of interesting exceptions to the rule in this book. Some aircraft have replacement tails, for example, finished in a different color. Other times, field applied camouflage resulted in a very different look than the standard RLM-authorized scheme. As this is a late-war book, the aircraft presented are pretty much exclusively Fw 190s and Bf 109s, and all late model marks, too. For the modeler, there are plenty of intriguing variations in individual markings as well. Also presented here is some information on Romanian fighters, as they supported the Germans during their retreat. Their Bf 109s offer an interesting counterpoint to the Luftwaffe examples. As is expected from the Jagdwaffe series, this book presents this information in a wonderfully written text, punctuated with interesting sidebars. Throughout the book are dozens and dozens of excellent photos, as well as maps and tables. Also, a staple of the Jagdwaffe series, this book has the usual high quality profile illustrations from noted aviation artist Tom Tullis, bringing color to some of these unusually finished aircraft. With this book, the Jagdwaffe series comes closer to its end, with only two more volumes left. It has been a fascinating journey, and one well worth taking. For anyone interested in the Luftwaffe during the Second World War, this is a book, and a series, that you do not want to miss. My thanks to Specialty Press for the review sample. Visit their website to order this, and other Jagdwaffe titles.